Prince Charles has said he finds it "unbelievable" when people ask why tackling "terrifying environmental issues" should be a priority. 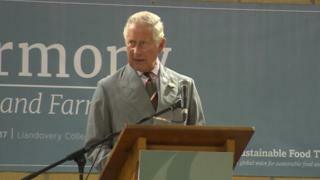 Addressing a sustainability conference in Llandovery College, Carmarthenshire, he said humans were "doing our utmost to test to destruction" the living system of nature. The speech was part of the Prince's annual summer tour of Wales. He later described the Welsh dairy industry as of "great importance". During the 20-minute speech, the Prince of Wales said traditional architecture, crafts, music, education and engineering could be used to tackle the "enormous problems we face". "This is not backward-looking and anti-science, it is reinstating the discarded baby that was rashly removed with the bath water," he added. Prince Charles later opened an extension at Rachel's Organic yoghurt factory in Llanbadarn Fawr, near Aberystwyth, where he opened an earlier expansion almost 20 years ago. He said: "I do hope that it will make an enormous difference not only in terms of sales but also in terms of the dairy sector in Wales which is of such great importance." On the second day of his five-day tour, the Prince also visited the historic Strata Florida site in Ceredigion and wore white gloves to examine the Nanteos Cup - considered by some to be the Holy Grail. Linda Tomos, the national librarian for Wales, told him: "The Holy Grail legend dates to 1905, when it was very fashionable. "The healing properties are undoubtedly very, very old."